Upon my arrival to DC, I started working to lay the groundwork for the Afghanistan Peace Campaign (APC). This campaign is not officially launched yet, so I have been doing in-depth research and news analysis on the peace efforts to end violence in Afghanistan, known as Kabul Process. Because I wanted to experience organizational fieldwork as well and I found many interesting opportunities, I ended up taking on two organizational field placements. So, with the APC I can now say that I am completing three internships! The first organization I work with is the International Civil Society Action Network (ICAN) which is focusing on women, peace and security, and the second is Center for International Private Enterprise (CIPE), where I can put my focus on anti-corruption compliance. For this blog, I wanted to focus on my personal experience with ICAN. ICAN is a small organization, but a very professional one. When seeing their office, one cannot believe that so many creative and professional programs and projects are improvised, planned, and implemented in two small rooms. Their office is situated in the Brookings Institution’s building, so it is a small two–room organization at the heart of one of the biggest think tanks in Washington, DC: what a contrast! ICAN has an established relationship with small women-led peacebuilding organizations in many countries affected by conflict. Their relationship is not like a donor-and-receiver one, but like two collaborating entities with the same mission: successful peace and sustainability. As part of my internship with ICAN, I am supposed to contact the Afghan partners and facilitate work and collaboration. I have been going through proposals and working on their monitoring and evaluation. I started corresponding with the founder of one of the Afghanistan NGOs to inquire about her activities. While speaking with her a few times, and as it is the case with nearly all Afghans, we were trying to find a mutual relation or friend. Again, as it is the case with all these attempts, we were successful! Her son-in-law who is living a few minutes from us is a mutual friend of my husband. The NGO holder was coming to the U.S. for a visit. I decided to visit and welcome her in a friendly manner, another Afghan tradition. And to my surprise, I found her to be a humble woman working for the improvement of Afghan women. Nearly unaware of all those theories of peacebuilding, deradicalization, integration, preventing and countering violent extremism, bottom-up approach and above all ‘Do No Harm,’ she is implementing and practicing these ideas impactfully and in highly committed ways. Since meeting this woman, my mind has been preoccupied with her and with wondering what all other activists are doing in such societies. I have learned more from her than from any event, seminar or symposium I have attended in DC and those theories and books I have read. She spoke with me about her experience very briefly, but each of those experiences was very informative and educational for me. My new friend told me how she could mobilize 11 groups of Taliban. While the majority of INGOs and NGOs are working in the urban areas of Afghanistan and do not dare to go and work in the rural and remote areas, she is among the few who dared to go to those areas where mostly the Taliban and other insurgent groups reside. She believes these areas need the deradicalization and educational programs more than any other place. Her NGO provides training and workshops for the people in those areas without differentiating between Talib or not-Talib families. This made her very popular, especially in the remote areas. She said she has a picture of a Taliban Commander who is distributing hygienic kits among women. This woman uses different tactics, from approaching the wives of members of the Taliban to be intermediaries and speak with their husbands, to providing them with short-term funds to launch entrepreneurship activities. She is very strategic and is able to identify and use these points of entry with the conservative people in remote areas in order to deradicalize them. Her activities remind me of mediation theories and the importance of using local potential to solve problems. She provided a sewing machine for a Talib wife with funds out of her own pocket so that the wife could sew as a bread-and-butter job. She tried to provide the sewing machine before the recent Afghanistan parliamentary election. When she was asked why she was in a rush to buy the machine and could not wait for funds, she answered that she was going to provide it before the election in the hope that it might aid in deradicalization. For instance, if the woman’s husband possibly was going to jeopardize the election, he might decide not to when he sees that there are people who care about their family and try to help them. It reminds me of the importance of identifying potential dangers and root causes and trying to tackle them before they become chronic and out of control. This woman told me about a Talib who came to her and asked for help to start a small shop for selling dung (which people still use as fuel in rural areas). The Talib promised her that if he could have a small source of income, he would never continue fighting. She also spoke of many challenges as well. She said that after conducting workshops and entrepreneurship training for many women in the rural areas, the Taliban wives came to her and asked for the same programs for themselves. She tried to persuade other international NGOs to conduct such programs for them, but they refused for fear that if something threatening happened, they would be blamed for letting the wives of the Taliban in amongst other people. While reading some of the proposed projects at ICAN, I was surprised to see that nearly all the proposals are written very eloquently, professionally, and effectively. NGOs have successfully implemented programs from making documentaries about women to holding focus group discussions, capacity building training, doing research, and promoting national dialogues. As I think about the principle of the local turn, I now am able to see that truly the people on the ground can identify the root causes of conflicts, know how to address them, and improvise very professional solutions to tackle them far better than any professional outside intervener. At first it seemed to me that someone with a very extensive background on peace and conflict might have written the proposals: someone who either has studied this field for many years or worked in the highest position within this discipline so he or she could address these issues so elaborately. But as I get to know the NGOs and their workers more, I understand that this level of proficiency and expertise has been gained by being in the field, working on the ground, and collaborating with locals and taking them into account. One of these activist women with whom I spoke once told me that people are tired of hearing the rhetoric of “political peace” and that they want “people peace.” It was so interesting to me that these activists, many of them nearly unaware of all peace studies theories, can still identify the exact problems facing their communities. And above all, that they take the initiative to tackle the problem themselves. I wish that they could have more support in order to start a durable and inclusive peace from the bottom up. 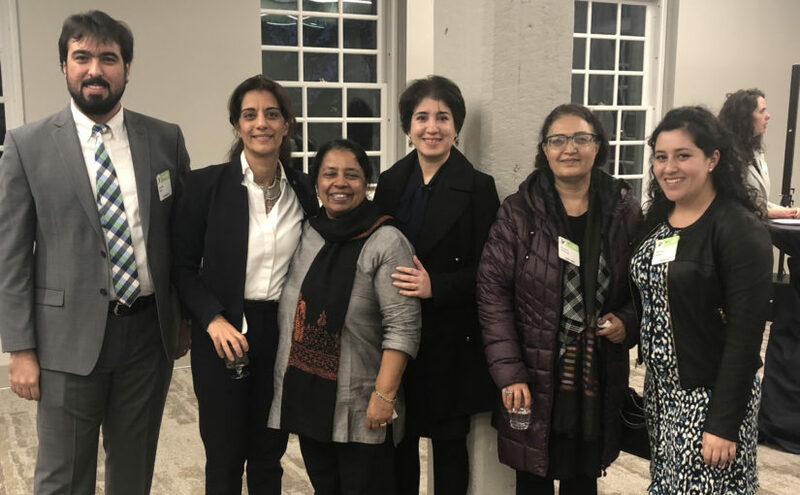 Photo at top of story: Advancing the Women, Peace and Security Agenda: Understanding Masculinities at USIP with ICAN and its partners, from Iraq, Afghanistan, and Sri Lanka.